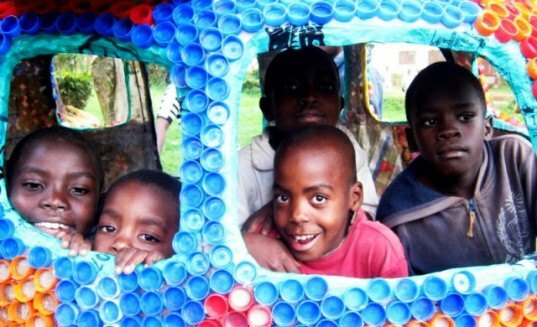 Ugandan artist and teacher Ruganzu “Bruno” Tusingwire has created an amazing recycled amusement park for Ugandan children that is made from thousands of repurposed plastic bottles. The amusement park was designed for kids growing up in the slums who have limited access to safe areas for play and education. Tusingwire’s design gives the children a physiological and emotional lift through recreation, and the curious use of materials and inventive structures have sparked new ways for the children to learn from and engage with their environment. The project was just awarded the first 2012 TED Prize at the TEDxSummit in Doha, Qatar. Tusingwire, originally a gallery artist, began to one focus on humanitarian relief efforts when he realized that Uganda suffered from extreme poverty and a lack of access to education. A mysterious brain disorder dubbed “nodding disease” had also started to overtake areas of the country. The disease is estimated to afflict 3,000 children in the north of the country, leaving children physically stunted and mentally disabled. Tusingwire was inspired to build his recycled amusement park when he got involved in eco-art as a student at Kyambogo University. He began meeting other local artists, and together, they made artwork out of the garbage dotting the streets of the city. Tusingwire was the lead organizer of the first ever TEDxKampala, which focused on the ways in which local artists could employ recycled materials as content for their art. His initiative not only strengthened the community of those already engaged in eco-art, but it brought in new artists and environmentalists into the fold. 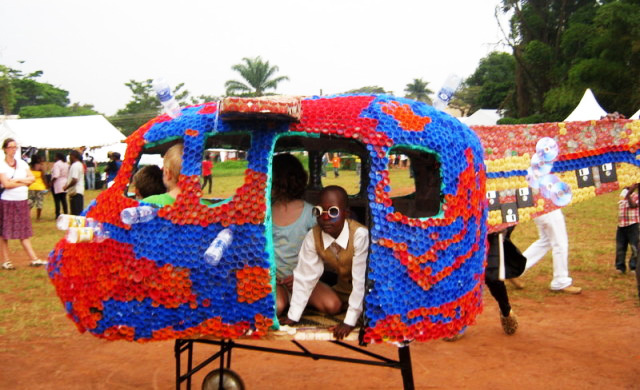 Ugandan artist and teacher Ruganzu "Bruno" Tusingwire has created an amazing recycled amusement park for Ugandan children that is made from thousands of repurposed plastic bottles. The amusement park was designed for kids growing up in the slums who have limited access to safe areas for play and education. Tusingwire's design gives the children a physiological and emotional lift through recreation, and the curious use of materials and inventive structures have sparked new ways for the children to learn from and engage with their environment. The project was just awarded the first 2012 TED Prize at the TEDxSummit in Doha, Qatar.